"Please take your groceries," she says, the moment I enter my four-digit password and press enter, finishing off my afternoon shopping excursion at the neighborhood Safeway. I grab my reusable shopping bags from inside the plastic grocery basket, trying to figure out which items should go in first. "Please take your groceries," she says again, in that insistent overly-pleasant voice, as my stress starts to rise. I put the heavy stuff in first: a box of cereal, a container of sea-salt, and the tray of meat destined for the oven a little later in the afternoon. I'm very concerned about my two loaves of way-too-expensive bread, wanting to have them perched on the top of the pile, safe from any danger of getting squished. "Please take your groceries," she spouts off one more time, way too friendly, and way too soon, my pulse beginning to race, my blood pressure going up. "Please take your groceries," she says as the white slip of paper begins curling out from under the lip of the automated teller. I grab for it eagerly and fold the long receipt in three, extract the wallet from the back of my jeans, open it up and begin stuffing the paper inside. "Shuddup," I say - a little too loudly - unable to contain my inner voice any longer, craning my neck from left to right to check if anyone heard me. I grab one bag, then the other, make a beeline for the door as the echo of "Please take your groceries" reverberates in the distance. 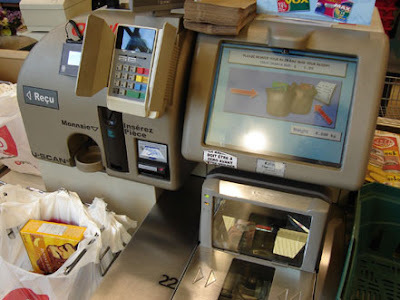 I have yet to make it through the self-checkout without havign to get someone to 'fix' the thing to make it work. It tends to take me longer than if I go through the regular till. I would rather have a person than a machine to deal with. hahaha.... really funny but so true.... it really gets on ur nerves even the GPS when it doesn't know the way as well as u do, it keeps repeating please move to highlighted route!